The padohi regiment contains 81 main members plus several fissaries, coincidics, and exotics. This regiment has hyic symmetry. Padohi and its other 80 main regiment members have 1440 vertices and 7200 edges. 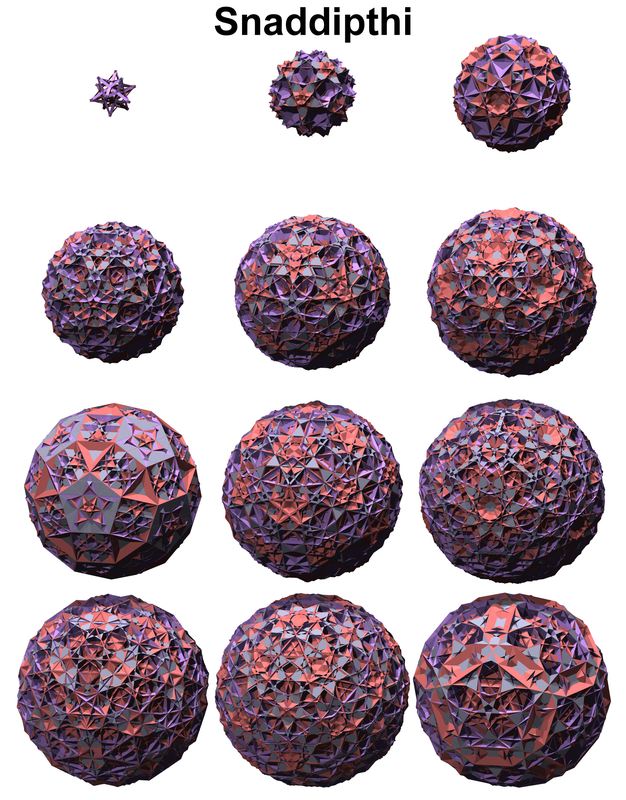 It's verf is a pentagonal antipodium. It's cells are 120 sissids, 120 ikes, 720 stips, and 1200 trips. Many of these are quite complex looking. Padohi is one of the 4-D analogues of raded. 15 of these are tame, 2 are feral, the rest are wild. Padohi members not only have conjugates (which are the gidipthi members), they also have "reverts", "inflections", and "inflectoverts". The "revert" of a polychoron is the polychoron which has a vertex figure that looks like the upside down version of the original's verf. The "inflection" of a padohi member is the one that does the following swap on the faces: ike's triangles - pentagons, gike's triangles - pentagrams, squares - hexagons, decagons to themselves. The revert of the inflection is the same as the inflection of the revert which we can call the "inflectovert". These first seven are all tame and self-reverted. There are three inflection pairs of orientable members, while the last one is non-orientable and self-inflected. The first four have Wythoffian symbols and can be refered to as "officers" of the regiment. The vertex figures are shown above. 985. Padohi - (PAD o hi) prismated dis120. Its cells are 120 sissids, 120 ikes, 720 stips, and 1200 trips. Its symbol is xo^o*x. This is the colonel of the regiment. 986. Sidpixathi - (sid PIK sa thee) small dipentary 600tris120. Its cells are 120 gikes, 120 gads, 120 tis, 600 tuts. Its symbol is (xo*o^x). This is one of the sergeants of the regiment. 987. Sisdipthi - (sis DIP thee) small small dipentary tris120. Its cells are 120 sissids, 120 ikes, and 120 sidditdids. Its symbol is o^(o*'x^x). This is one of the sergeants of the regiment. 988. Sidipthi - (sih DIP thee) small dipentary tris120. Its cells are 120 gikes, 120 gads, and 120 saddids. Its symbol is o*(o^'x^x). This is the conjugate of gidipthi and therefore it is the lieutenant of this regiment. 989. Sidpadiphi - (SID pa DIP thee) small dipentary diprismato120. Its cells are 720 stips, 1200 trips, and 120 sidditdids. 990. Sidpixady - (sid PIX a dee) small dipentary 600dis120. Its cells are 600 tuts, 120 tis, and 120 saddids. 991. Sidpaxhi - (sid PAK she) small dipentary 600-120. Its cells are 120 ris and 600 choes. These eight are grouped into four pairs of inflections. These are all orientable, wild, and self-reverted. The vertex figures are shown above. 992. Sidpixhixthi - (SID pik SHIX thee) small dipentary 600-120-600tris120. Its cells are 120 sissids, 120 ikes, 600 coes, 120 radeds, 600 tuts, and 120 tis. 993. Siddip Dipthix - (SID dip DIP thix) small dipentary disprismatotris120-600. Its cells are 120 gikes, 120 gads, 600 ohoes, 120 ideds, 720 stips, and 1200 trips. 994. Sidpuxthi - (sid PUX thee) small dipentary 600tetris120. Its cells are 120 sissids, 120 ikes, 600 coes, 120 radeds, and 120 saddids. 995. Sidpathihix - (sid PATH e hix) small dipentary tris120-120-600. Its cells are 120 gikes, 120 gads, 600 ohoes, 120 ideds, and 120 sidditdids. 996. Sidputhix - (sid POO thix) small dipentary tetris120-600. Its cells are 120 sissids, 120 ikes, 600 ohoes, 120 ideds, and 120 saddids. 997. Sidpid Hixady - (SID pid HIK sa dee) small dipentary dis120-600dis120. Its cells are 120 gikes, 120 gads, 600 coes, 120 radeds, and 120 sidditdids. 998. Sidpid Phixhi - (SID pid FIK she) small dipentary disprismato120-600-120. Its cells are 720 stips, 1200 trips, 600 ohoes, 120 ideds, and 120 saddids. 999. Sidphiddixady - (SID fid DIK sa dee) small dipentary 120dis600dis120. Its cells are 600 tuts, 120 tis, 600 coes, 120 radeds, and 120 sidditdids. These six are grouped into three pairs of reverts (which are also inflections). These are self-inflectoverted. All of these are non-orientable. The first two are feral, the others are wild. 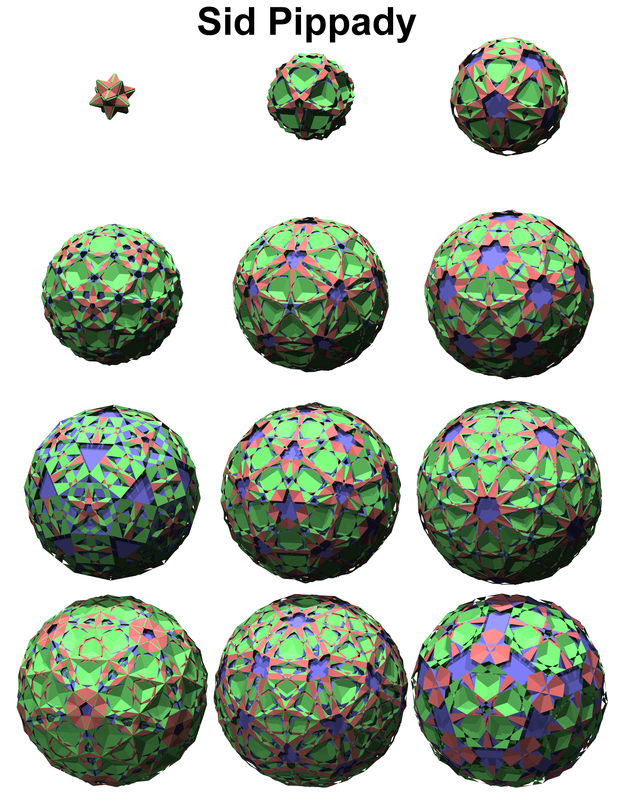 The vertex figures are shown above. 1000. Sicdip Pixthi - (SIK dip PIX thee) small capped dipentary prismato600tris120. Its cells are 120 sissids, 120 gads, 720 stips, 120 tis, and 600 choes. 1001. Sibdip Pixthi - (SIB dip PIX thee) small based dipentary prismato600tris120. Its cells are 120 gikes, 120 ikes, 1200 trips, 600 tuts, and 120 ris. 1002. Sidpupthi - (sid PUP thee) small dipentary prismatotetris120. Its cells are 120 sissids, 120 gads, 720 stips, 120 tis, and 120 ris. 1003. Sidpip Dixady - (SID pip DIK sa dee) small dipentary prismatodis600dis120. Its cells are 120 gikes, 120 ikes, 1200 trips, 600 tuts, and 600 choes. 1004. Sidphixipthi - (SID fik SIP thee) small dipentary 120-600prismatotris120. Its cells are 120 sissids, 120 gads, 1200 trips, 600 tuts, 120 srids, and 120 siids. 1005. Sidpid Hipthi - (SID pid HIP thee) small dipentary dis120prismatotris120. Its cells are 120 gikes, 120 ikes, 720 stips, 120 tis, 120 srids, and 120 siids. These eight are grouped into two sets of four. Each set is a revert-inflection set (revin for short), containing a polychoron with its revert, inflection, and inflectovert. The second set has spiky verfs. All of these are tame and non-orientable and have only three types of cells. 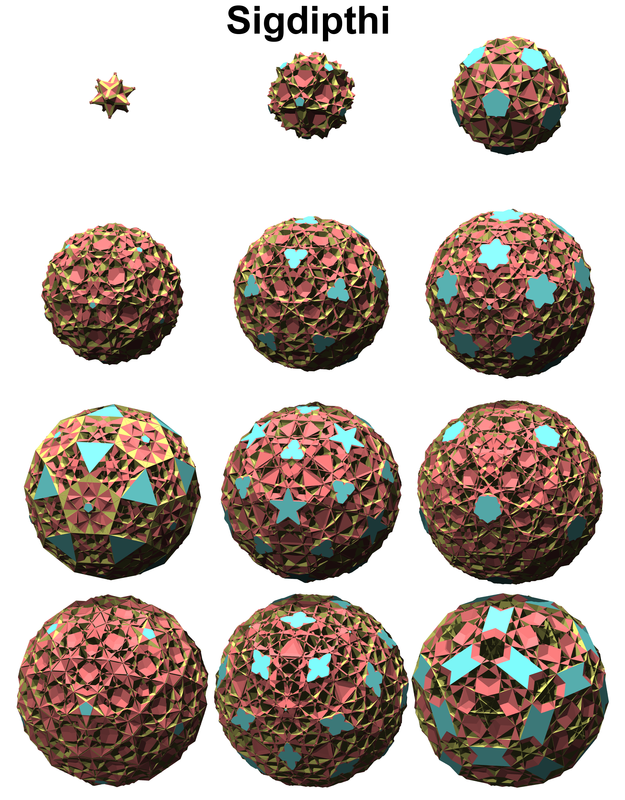 The vertex figures are shown above. 1006. Sidpapixhi - (SID pa PIK she) small dipentary prismato600-120. Its cells are 120 gikes, 1200 trips, and 600 coes. 1007. Sid Pippady - (sid PIP a dee) small dipentary prismatodis120. Its cells are 120 gads, 720 stips, and 120 radeds. 1008. Sigdipthi - (sig DIP thee) small great dipentary tris120. Its cells are 120 sissids, 120 tis, and 120 ideds. 1009. Sad Phiddix - (sad FID dix) small dipentary 120dis600. Its cells are 120 ikes, 600 tuts, and 600 ohoes. 1010. Sidphihix - (sid PHI hix) small dipentary 120-120-600. Its cells are 120 gikes, 600 tuts, and 120 siddies. 1011. Snaddipthi - (snad DIP thee) small spinodipentary tris120. Its cells are 120 gads, 120 tis, and 120 siddies. 1012. Snid Phiphi - (snid FEE fee) small spinodipentary 120prismato120. Its cells are 120 sissids, 720 stips, and 120 sirds. This one has holes and a framed core like structure. 1013. Snid Pippady - (snid PIP pa dee) small spinodipentary prismatodis120. Its cells are 120 ikes, 1200 trips, and 120 sirds. These eight form two revin sets of four. The "caps" are the four cells: sissid, gike, ike, and gad (ike and gad can be called bases also), these cells appear as caps or bases on the vertex figure. This group along with the next two groups only have one cap cell. All of these are non-orientable and wild. These have four types of cells. 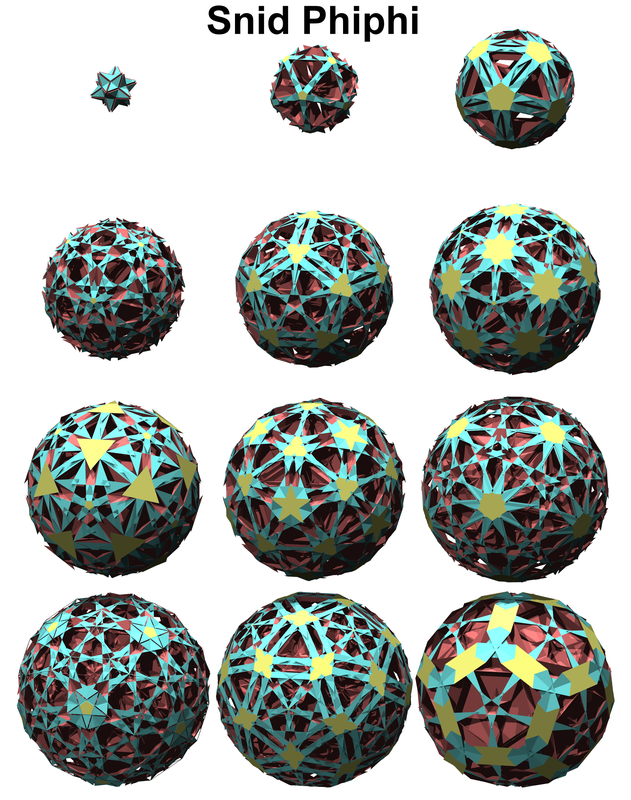 The vertex figures are shown above. 1014. Sicdappixthi - (SIC da PIX thee) small capped dipentary 600tris120. Its cells are 120 gikes, 120 tis, 600 choes, and 120 srids. 1015. 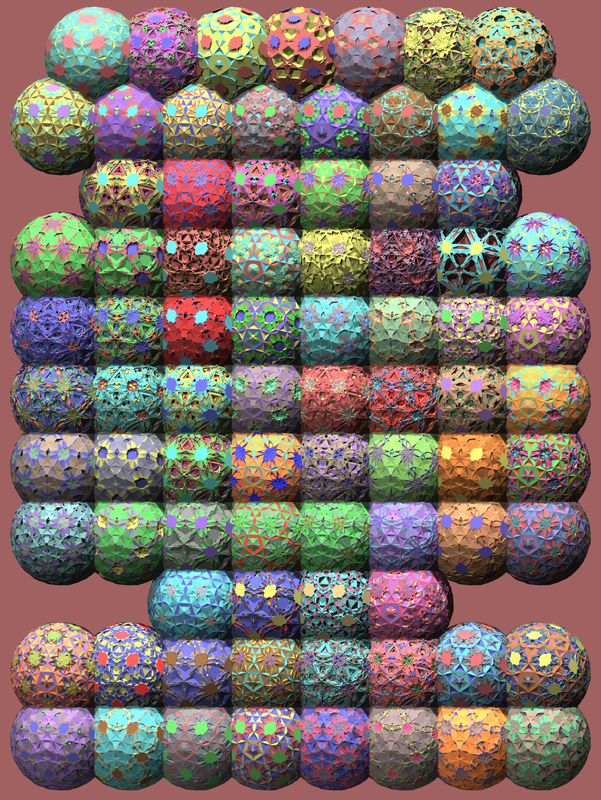 Sibdappixthi - (SIB da PIX thee) small based dipentary 600tris120. Its cells are 120 gads, 600 tuts, 120 ris, and 120 srids. 1016. Sidpipthi - (sid PIP thee) small dipentary prismatotris120. Its cells are 120 sissids, 1200 trips, 120 ris, and 120 siids. 1017. Siddip Phixhi - (SID dip FIK she) small dipentary prismato120-600-120. Its cells are 120 ikes, 720 stips, 600 choes, and 120 siids. 1018. Siddip Xappady - (SID dip ZAP a dee) small dipentary 600prismatodis120. Its cells are 120 gikes, 720 stips, 600 coes, and 120 sidditdids. 1019. Sibed Pipithi - (seib'd PIP a thee) small invertibased dipentary prismatotris120. Its cells are 120 gads, 1200 trips, 120 radeds, and 120 sidditdids. 1020. Side Pixhidy - (SIDE pik SHY dee) small invertidipentary 600-120dis120. Its cells are 120 sissids, 600 tuts, 120 ideds, and 120 saddids. 1021. Side Phixady - (side FIK sa dee) small invertidipentary 120-600dis120. Its cells are 120 ikes, 120 tis, 600 ohoes, and 120 saddids. These eight have four types of cells and are single-capped like the last group, but with one noticeable change - they have spikey verfs leading to spikey edges. All of these are non-orientable and wild. They form two revin sets. 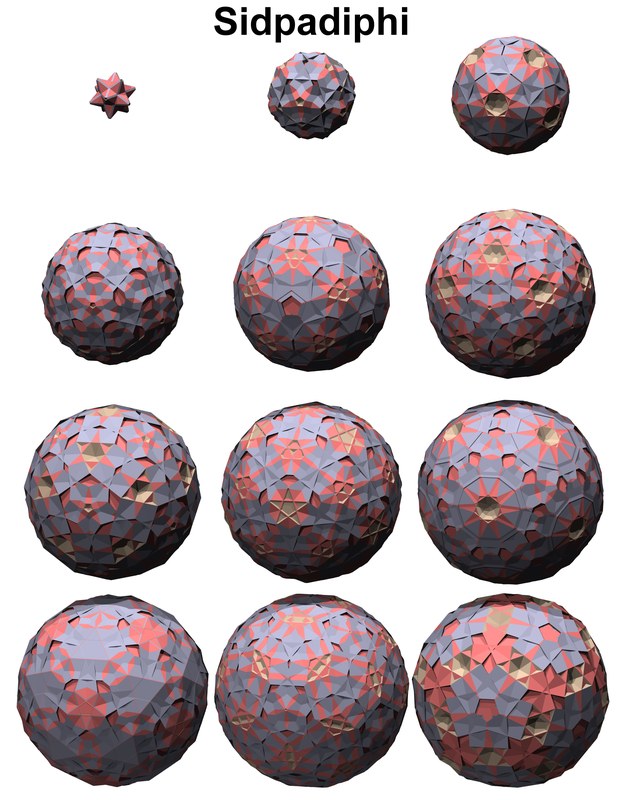 The vertex figures are shown above. 1022. Snic Dapixthi - (SNIC da PIX thee) small spinocapped dipentary 600tris120. Its cells are 120 gikes, 600 tuts, 120 ris, and 120 sirds. 1023. Snib Dapixthi - (SNIB da PIX thee) small spinobased dipentary 600tris120. Its cells are 120 gads, 120 tis, 600 choes, and 120 sirds. 1024. Sidphiphix - (sid FEE fix) small dipentary 120prismato120-600. Its cells are 120 sissids, 720 stips, 600 choes, and 120 siddies. 1025. Sidphipdy - (sid FIP dee) small dipentary 120prismatodis120. Its cells are 120 ikes, 1200 trips, 120 ris, and 120 siddies. 1026. Sidpid Hiddix - (SID pid HID dix) small dipentary dis120dis600. Its cells are 120 gikes, 600 tuts, 600 choes, and 120 sirds. 1027. Snidupthi - (snid DUP thee) small spinodipentary tetris120. Its cells are 120 gads, 120 tis, 120 ris, and 120 sirds. 1028. Snidpid Hiphi - (SNID pid HIF fee) small spinodipentary dis120prismato120. Its cells are 120 sissids, 720 stips, 120 ris, and 120 siddies. This one has holes. 1029. Sidphippixhi - (SID fip PIK she) small dipentary 120prismato600-120. Its cells are 120 ikes, 1200 trips, 600 choes, and 120 siddies. These sixteen have five types of cells. These are wild, non-orientable, and single-capped. These form four revin sets. The vertex figures are shown above. 1030. Sidpid Pixady - (SID pid PIK sa dee) small dipentary disprismato600dis120. Its cells are 120 gikes, 720 stips, 1200 trips, 600 tuts, and 120 siids. 1031. Sidpadiphdy - (SID pa DIF dee) small dipentary disprismato120dis120. Its cells are 120 gads, 720 stips, 1200 trips, 120 tis, and 120 siids. 1032. Sicdiphip Xady - (SIC dif fip ZAY dee) small capped dipentary 120prismato600dis120. Its cells are 120 sissids, 600 tuts, 120 tis, 720 stips, and 120 srids. 1033. Sibdiphip Xady - (SIB dif fip ZAY dee) small based dipentary 120prismato600dis120. Its cells are 120 ikes, 600 tuts, 120 tis, 1200 trips, and 120 srids. 1034. Sidpiphithi - (sid PIF uh thee) small dipentary prismato120tris120. Its cells are 120 gikes, 720 stips, 120 ideds, 120 srids, and 120 siddies. 1035. Sidpithipix - (sid PITH ee pix) small dipentary tris120prismato600. Its cells are 120 gads, 1200 trips, 600 ohoes, 120 srids, and 120 siddies. 1036. Sidpaddy Dixhi - (SID pad dee DIK she) small dipentary dis120dis600-120. Its cells are 120 sissids, 600 tuts, 600 coes, 120 siids, and 120 sirds. 1037. Side Pidhithi - (SIDE pid HITH thee) small invertidipentary dis120tris120. Its cells are 120 ikes, 120 tis, 120 radeds, 120 siids, and 120 sirds. 1038. Sicdip Pidhixhi - (SIC dip pid HIK she) small capped dipentary prismatodis120-600-120. Its cells are 120 gikes, 720 stips, 600 ohoes, 120 ris, and 120 sidditdids. 1039. Sibdip Pidhixhi - (SIB dip pid HIK she) small based dipentary prismatodis120-600-120. Its cells are 120 gads, 1200 trips, 120 ideds, 600 choes, and 120 sidditdids. 1040. Sidpixthix - (sid PIX thix) small dipentary 600tris120-600. Its cells are 120 sissids, 600 tuts, 120 radeds, 600 choes, and 120 saddids. 1041. Sidpathixhi - (sid pa THIK she) small dipentary tris120-600-120. Its cells are 120 ikes, 120 tis, 600 coes, 120 ris, and 120 saddids. 1042. Sidpaxid Hidy - (sid PAK sid HI dee) small dipentary 600dis120dis120. Its cells are 120 gikes, 120 tis, 600 coes, 120 radeds, and 120 siids. 1043. Sidphixdahix - (sid FIX da hix) small dipentary 120-600dis120-600. 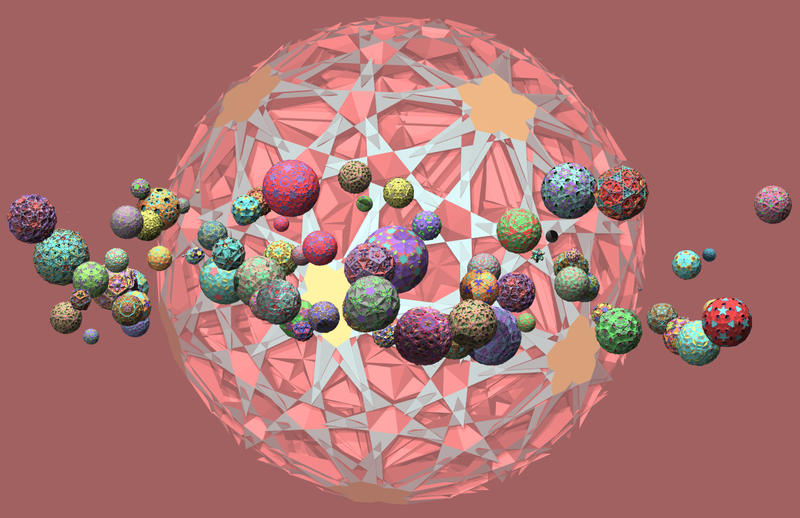 Its cells are 120 gads, 600 tuts, 600 coes, 120 radeds, and 120 siids. 1044. Sicdip Thipix - (SIC dip THI pix) small capped dipentary tris120prismato600. Its cells are 120 sissids, 1200 trips, 600 ohoes, 120 ideds, and 120 srids. 1045. Sibdip Thipix - (SIB dip THI pix) small based dipentary tris120prismato600. Its cells are 120 ikes, 720 stips, 600 ohoes, 120 ideds, and 120 srids. These four have four types of cells, two of which are cap cells. They form a revin set. They are non-orientable and wild. The vertex figures are shown above. 1046. Sidphixady - (sid FIX a dee) small dipentary 120-600dis120. Its cells are 120 gikes, 120 ikes, 600 coes, and 120 sirds. 1047. Siddupthi - (sid DUP thee) small dipentary tetris120. Its cells are 120 sissids, 120 gads, 120 radeds, and 120 sirds. 1048. Sidphithi - (sid FITH thee) small dipentary 120tris120. Its cells are 120 sissids, 120 gads, 120 ideds, and 120 siddies. 1049. Sidpid Hixhi - (SID pid HIK she) small dipentary dis120-600-120. Its cells are 120 gikes, 120 ikes, 600 ohoes, and siddies. These eight have five types of cells, two of which are cap cells. There are two revin sets here. All of these are non-orientable and wild. The vertex figures are shown above. 1050. Sabdip Xuthi - (SAB dip ZOO thee) small based dipentary 600tetris120. Its cells are 120 gikes, 120 ikes, 600 ohoes, 120 ris, and 120 sirds. 1051. Scaddip Xuthi - (SKAD dip ZOO thee) small capped dipentary 600tetris120. Its cells are 120 sissids, 120 gads, 120 ideds, 600 choes, and 120 sirds. 1052. Scadupthix - (ska DUP thix) small capped dipentary tetris120-600. Its cells are 120 sissids, 120 gads, 120 radeds, 600 choes, and 120 siddies. 1053. Sabdupthix - (sab DUP thix) small based dipentary tetris120-600. Its cells are 120 gikes, 120 ikes, 600 coes, 120 ris, and 120 siddies. 1054. Sidpathidy - (SID pa THI dee) small dipentary tris120dis120. Its cells are 120 gikes, 120 gads, 120 ris, 120 siddies, and 120 srids. 1055. Sidpixhithi - (SID pik SHITH thee) small dipentary 600-120tris120. Its cells are 120 gikes, 120 gads, 600 choes, 120 siddies, and 120 srids. 1056. Sidphixthi - (sid FIX thee) small dipentary 120-600tris120. Its cells are 120 sissids, 120 ikes, 600 choes, 120 sirds, and 120 siids. 1057. Sidphiuthi - (sid FYOO thee) small dipentary 120tetris120. Its cells are 120 sissids, 120 ikes, 120 ris, 120 sirds, and 120 siids. These four have six types of cells, two of which are cap cells. These form a revin set. All of these are orientable and wild. The vertex figures are shown above. 1058. Siddip Puxthi - (SID dip PUX thee) small dipentary prismato600tetris120. Its cells are 120 gikes, 120 gads, 720 stips, 120 tis, 600 coes, and 120 siids. 1059. Siddip Xupthi - (SID dip ZUP thee) small dipentary 600prismatotetris120. Its cells are 120 gikes, 120 gads, 1200 trips, 600 tuts, 120 radeds, and 120 siids. 1060. Siddip Puthix - (SID dip POO thix) small dipentary prismatotetris120-600. Its cells are 120 sissids, 120 ikes, 1200 trips, 600 tuts, 120 ideds, and 120 srids. 1061. Siddip Thipox - (SID dip THI pox) small dipentary tetris120prismato600. Its cells are 120 sissids, 120 ikes, 720 stips, 120 tis, 600 ohoes, and 120 srids. These four have five types of cells with no cap cells, instead there are the facial ridges of pseudo-cells. These form a revin set. All of these are orientable and wild. 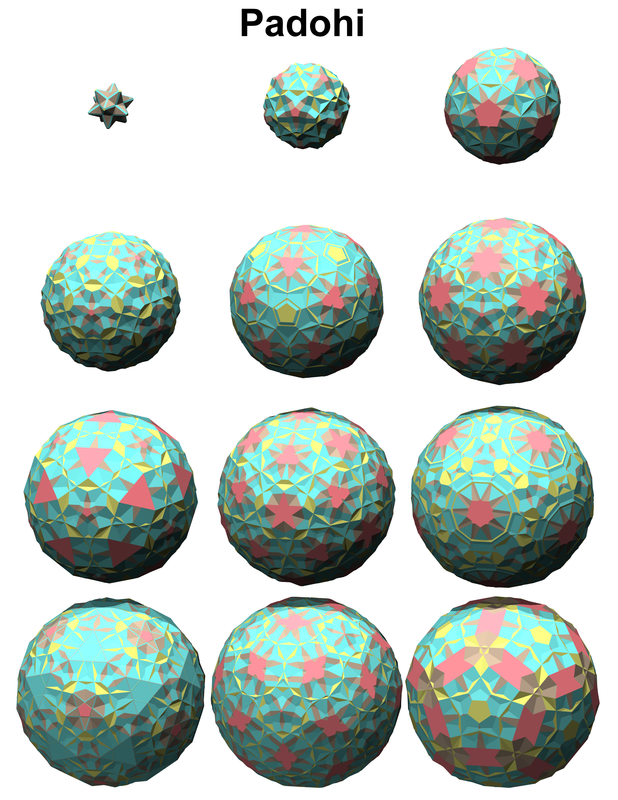 The vertex figures are shown above. 1062. Sidpipdyhix - (SID pip DI hix) small dipentary prismatodis120-120-600. Its cells are 720 stips, 120 tis, 600 ohoes, 120 srids, and 120 sidditdids. 1063. Siddip Phidhix - (SID dip FID hix) small dipentary prismato120dis120-600. Its cells are 1200 trips, 600 tuts, 120 ideds, 120 srids, and 120 sidditdids. 1064. Siddip Pathix - (SID dip PATH ix) small dipentary prismatotris120-600. Its cells are 1200 trips, 600 tuts, 120 radeds, 120 siids, and 120 saddids. 1065. Siddip Paxthi - (SID dip PAX thee) small dipentary prismato600tris120. Its cells are 720 stips, 120 tis, 600 coes, 120 siids, and 120 saddids. Below are slices of each of the padohis in order. If the first three (or more) letters are amongst these, then make the following swaps: sib-gic, sic-gib, sid-gid, sig-gig, sis-gis, sab-gac, sca-gab, sad-gad, snadd-gand, snid-gind, snic-ganb, snib-ganc, sibed-gicad, snidpid-gandpid, and scaddip-gabdip. Exceptions: padohi-quipdohi, sicdip pixthi-gicdip pixthi, sibdip pixthi-gibdip pixthi, snidupthi-gandupthi, sabdip xuthi-gabdip xuthi, sacdip xuthi-gacdip xuthi, sacdupthix-gacdupthix, and sabdupthix-gabdupthix.